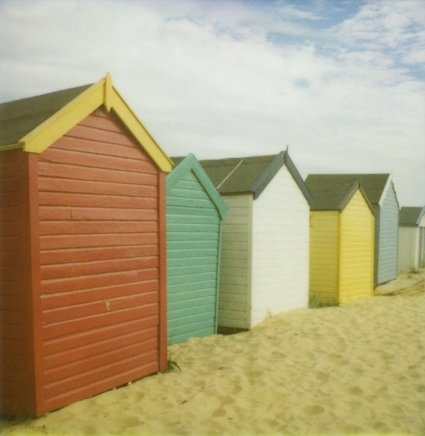 When we first caught site of this delightful photo from Jake Messenger in our flickr contacts, all we could talk about was how we could each live in one these adorable huts on the beach of Southwold, England and create our Purl Bee stories from there! Once we came down to earth our next thougt was that the graphic nature of the image would lend itself perfectly to a quilt. We felt that the image was modern enough to withstand a bit of abstraction, but romantic enough to hold its own as something soft and sewn. 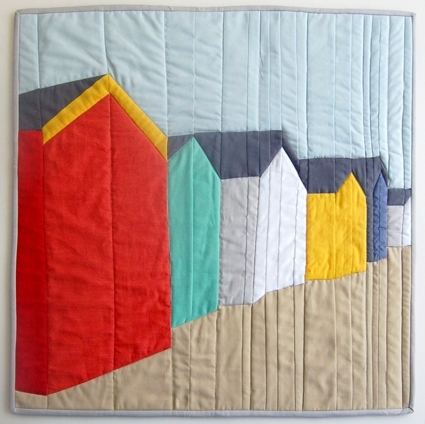 And let’s not forget the fact that all the straight lines made it a perfect candidate for strip piecing, a technique we’ve been planning to cover in our mini-quilt of the month series. 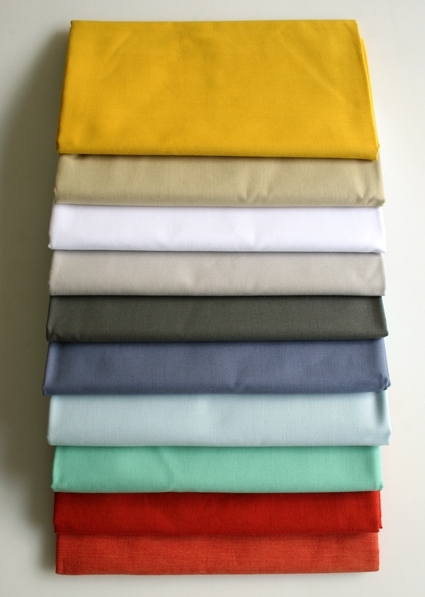 Did we mention the wonderful color palette as well? We love it! Admittedly we struggled a bit at first, settling upon a basic method for piecing from a photograph was challenging, there are so many ways to go about it. But eventually we settled on the method that you find here, and in doing so we also realized that our technique can be easily applied to almost any photograph. We hope you will enjoy the journey as much as we have! 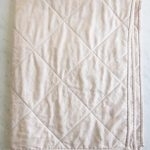 You can find all of our Mini Quilts right here. P.S. Please be sure to visit Jake Messenger’s website right here, his flickr page here and his etsy site right here, you won’t be disappointed! Thank you Jake for allowing us to use your beautiful photograph! 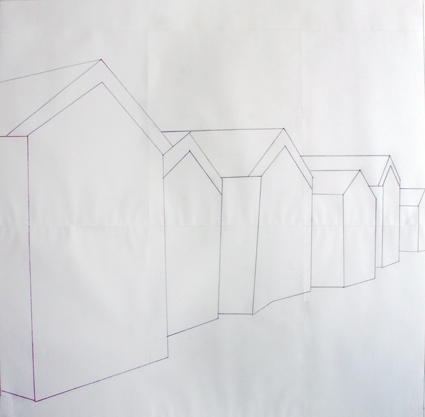 Photograph (we used Beach Huts from Jake Messenger. You can purchase this print from Jake right here). 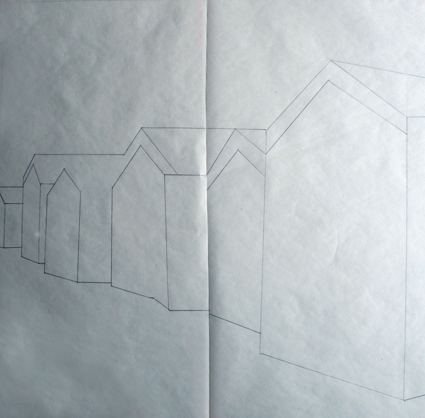 Using tracing paper laid over photograph and pencil trace outline of shapes. Use straight edge ruler to trace the straight lines. 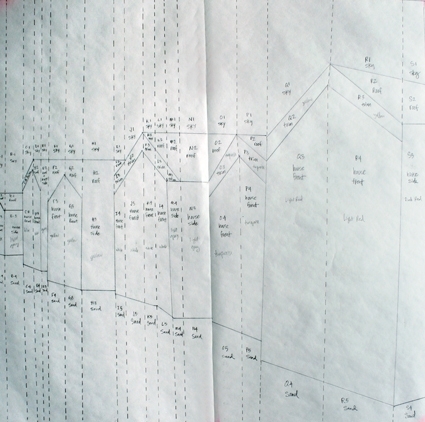 Tape tracing paper together if necessary to make it big enough to trace entire print. 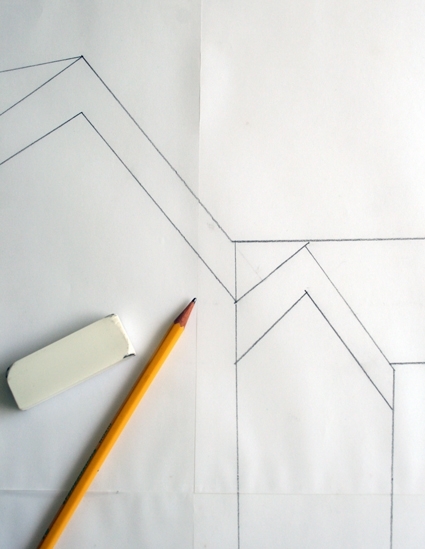 Once you have the drawing outlined you will want to simplify some of the shapes to minimize tricky piecing. For example, we had a lot of intersecting lines at the rooftops and edges of the houses as you can see in the image above. You can compare the two drawings above to see how we altered the lines to create simpler shapes for piecing using our eraser and pencil. Because all of our roofs are the same color fabric we simplified the roof lines to avoid piecing within the same color which you can see in the photo above. 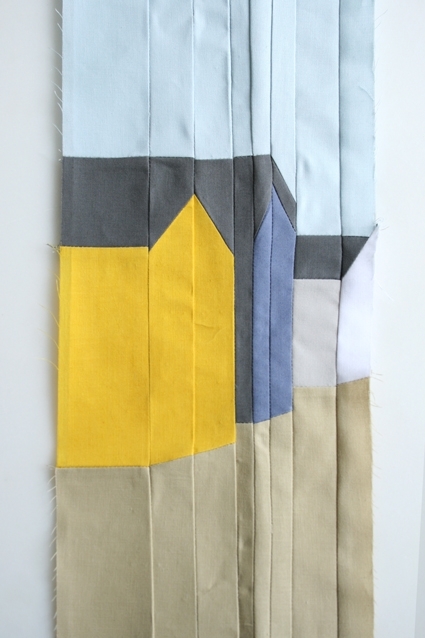 We simplified curved lines into short sections of straight lines for simpler sewing as pictured above where the sand meets the house. 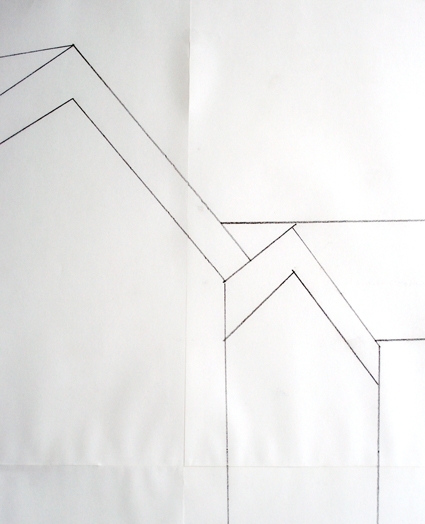 Once you have your traced drawing the way you want it, flip the tracing paper over so the entire image is reversed. If you cannot see the pencil lines clearly through the back of the tracing paper, go over entire drawing again with a black marking pen. 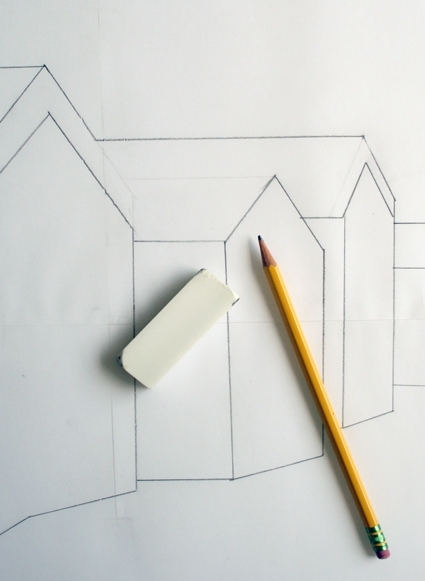 Tape tracing paper to a surface, lay freezer paper with shiny side down over your simplified traced drawing . 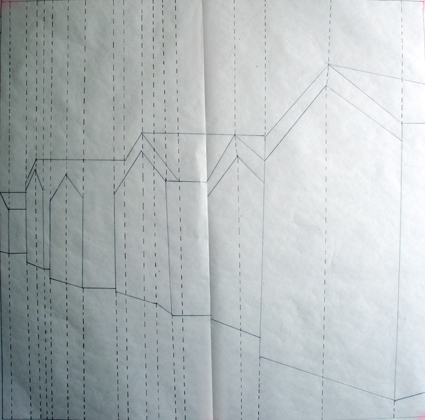 If your image is wider than the freezer paper tape paper together and place along a vertical line in your traced drawing (you can see where we pieced ours together along the center in the photo above). 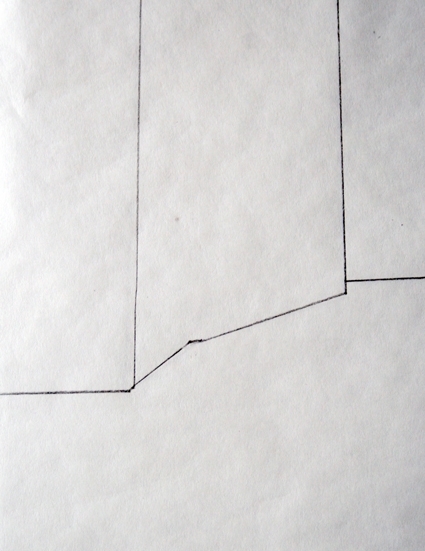 Tape freezer paper to your surface and retrace drawing onto freezer paper using pencil and ruler. 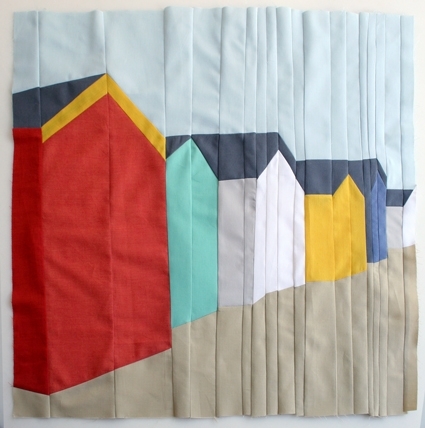 Break image up into vertical strips by drawing dashed lines above and below existing vertical lines on the buildings and also at sharp angles (such as our roof peaks) to avoid having to sew Y seams. 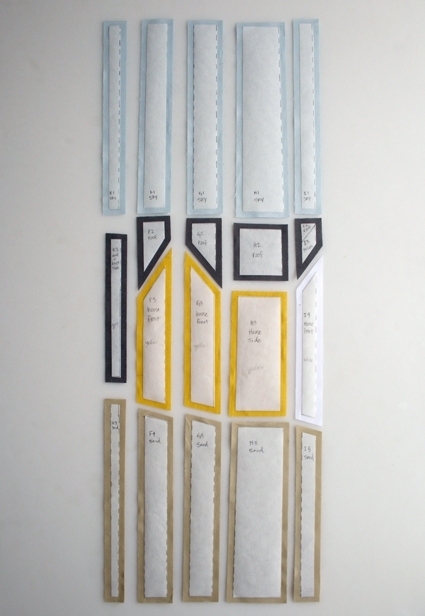 Next, name and number all of the pieces and indicate the fabric color. We gave ours letters going across A-S and numbers going vertically. Here is a detail of our naming and numbering system. See strip F for example, the sky is F1, the roof is F2, the house is F3 and the sand is F4. Taking the time to label everything is well worth it, it will be a huge help to you when you’re piecing so many tiny pieces! Cut strips along dashed lines with rotary cutter and then cut pieces within strips. We worked with no more than 4 – 5 strips at a time in order to minimize the chance of losing a piece while we worked. Note: If you have limited experience using a rotary cutter, I recommend visiting our Rotary Cutting Tutorial. Next, use a hot iron to press shapes onto the wrong side of your fabric. The freezer paper will easily stick to your fabric. Leave enough room between shapes to cut a 1/4-inch seam allowance around each piece. 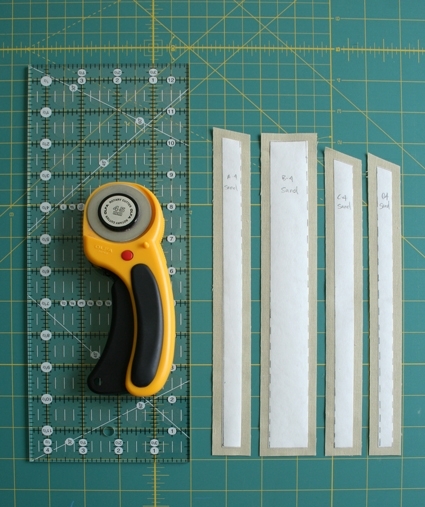 Use rotary cutter and cutting ruler to precisely cut out each shape leaving 1/4-inch seam allowance around the edges of the freezer paper shapes. After cutting, organize shapes to prepare for piecing. 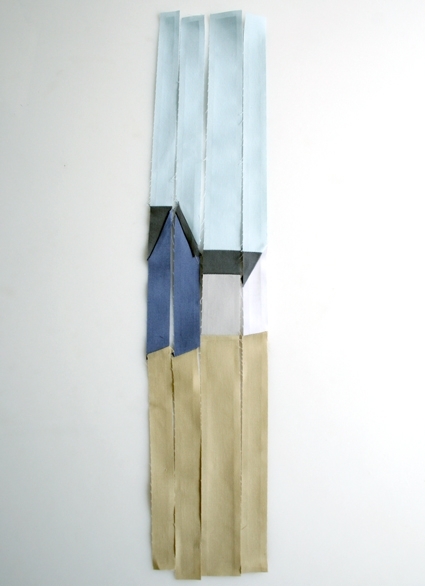 Shapes will be pieced in strips top to bottom, then strips will be sewn together. For angular pieces, use pins to help align shapes. 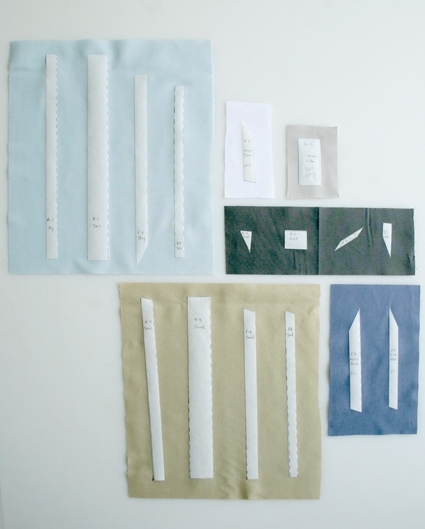 Place pins through corners of freezer paper templates on each piece as shown above. 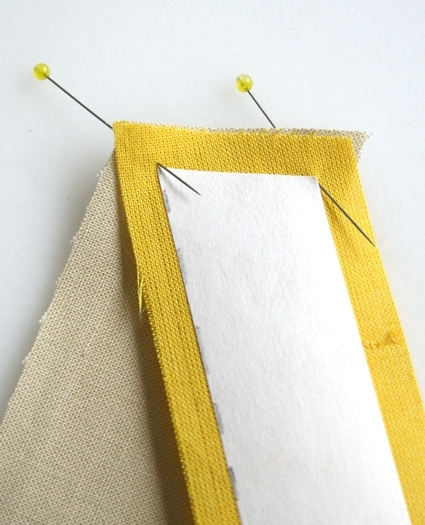 Bring pins back through to the front as shown above and sew using a 1/4-inch seam allowance (which will be just along the edge of the freezer paper). After sewing open the piece to make sure you’re happy with the alignment of your pieces. This is especially critical on more extreme angles. (Note: we had a few roof line pieces that had to be done twice!) The more precise your piecing is at this first stage the better, as imperfections will create challenges throughout the following steps. Don’t press seams yet. Here are our first 4 strips. 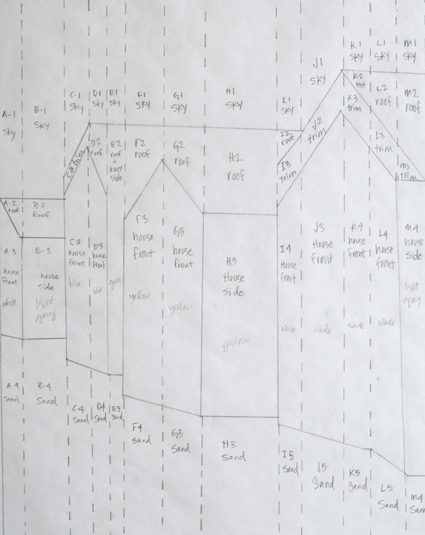 Before piecing strips together we pressed seams in opposite directions to reduce bulk where seams intersect. From right to left, we pressed the first strip’s seams upwards towards the top of the strip, the second strip’s seams downwards, the third strip’s seams up and the fourth strip’s seams down.Piece strips being careful to keep them in the correct order! 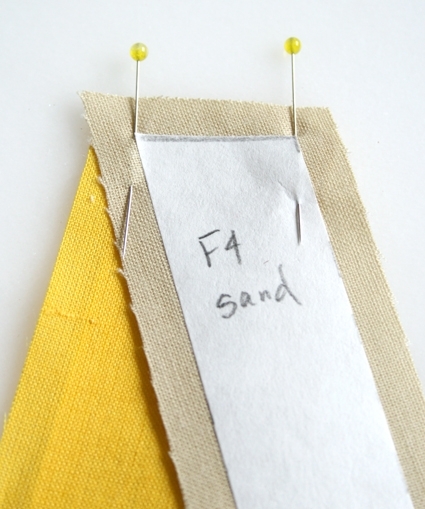 Use lots of pins to line up colors at intersecting seams. 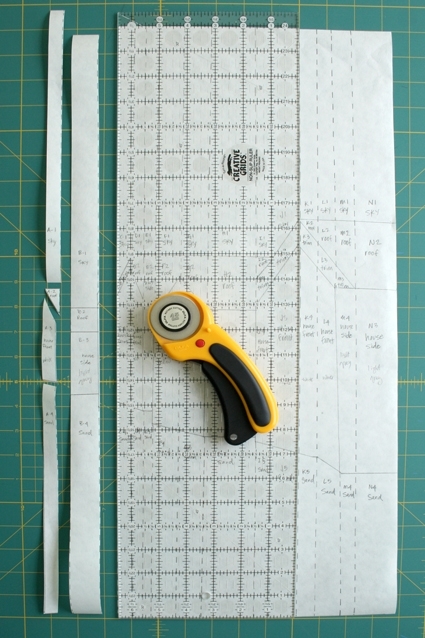 Sew strips together using a 1/4-inch seam allowance, which will be just along the edge of your freezer paper template. Continue, repeating steps above until your quilt top is complete. Trim top and bottom edges if necessary to create straight edges. You will need to baste, quilt and then bind the edges to finish. You can find complete instructions for these steps right here. 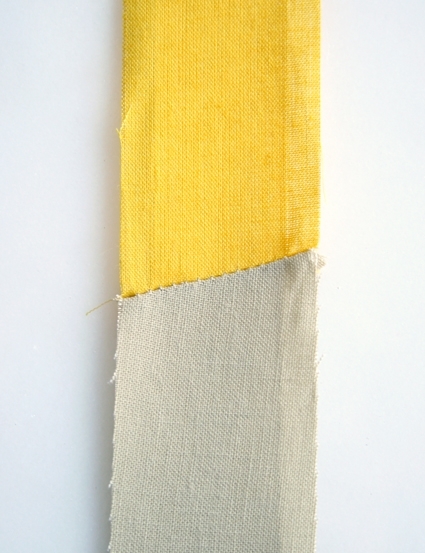 Once you reach the page, scroll down to the sections called “Baste”, “Quilt”, “Prepare the Binding” and “Bind the Quilt”. 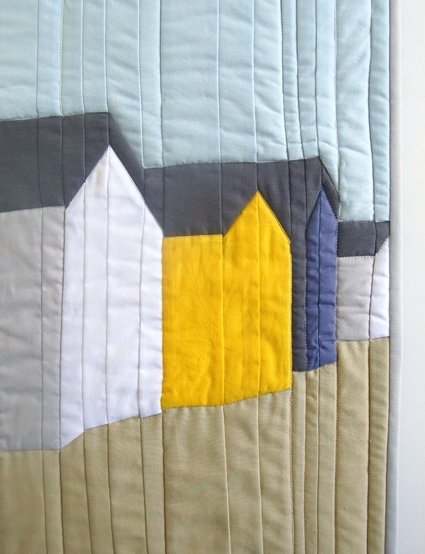 For our quilt we stitched along the roof tops, the base of the houses and between each building (and extending these vertical lines all the way up and down the quilt). Once you’re all through, hang your quilt on the wall and enjoy! I was in Southwold a fortnight ago! It's a beautiful place. Great subject for this picture quilt. 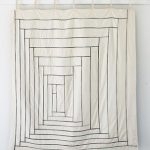 Hi Joellybaby – the finished quilt is approximately 21-inches x 21-inches. Thanks for pointing out that we didn't include that in the pattern, will do right now! I'm falling over at how lovely this is! Thanks so much for the technique tutorial. It's quite a bit of work, but I just know I'll be looking at photos with this project in mind now! What a wonderful image, and it translated so well into a quilt! It would also make an incredibly beautiful and original stained glass! “shiny side” is not very descriptive, as both sides of my freezer paper are equally shiny. Wax side up or down? It is wax side down. Wow! I just found this circulating on Pinterest. 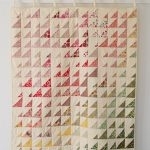 What an amazing, detailed tutorial for paper piecing. Looking forward to trying this technique. 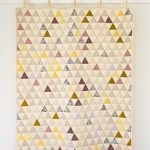 Absolutely lovely quilt! Thank you for sharing.